Home Encouraging When A Person Shows You Who They Are, Believe Them! 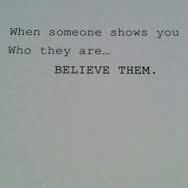 When A Person Shows You Who They Are, Believe Them! Being who we are authentically and truthfully is easy for some of us, for others, not so much. Those of whom that live their life in the facade of their Ego’s, live a life under a veil of untruths. These people, or this person will however show you their true and defining colours, eventually and when you least expect it. This revelation that comes to you may catch you off guard, but rest be sured, it is a gift from the Universe to help you ‘see’ what you may not have noticed before. While you are a witness to this astonishment pay close attention to how this other persons actions and words emotionally effect you. For it is your inner dialogue that will speak the truth to you about this person once and for all. When this wave of shock, wonder and incredulity hits you like a slap in the face, take it as such, because that is exactly what it is, a wake up call and nothing less. Your life has been exposed for a very long time, to the lies and deceit that have had you under some sort of spell. One day, when your Soul knows you are ready to see the truth, this other person will do something that perhaps they have always done, the difference is on this day, their behaviour gets your attention in a different kind of way. You have grown, your spiritual consciousness has elevated, this is because you have been working on yourself, diligently trying very hard to take better care of You. When your Soul begins to evolve, your perception of everything changes. It is similar to taking off a pair of dark sunglasses only to expose yourself to the light of the sun. Everything is more defined, brighter and much more clear when the glasses come off. Life can be like this too, we live in a shade of grey until we become spiritually more mature. Spiritual maturity allows us to be a conscious witness to actions and words that make our skin crawl, finally! We have always put up with, never said a word, swallowed our hurtful feelings, cried in silence and in the dark, until one day the spell we have been under is suddenly removed. When this day finally comes, remember this quote, when a person, whomever this person is, shows you who they are, believe them now and don’t dismiss what you had an emotional reaction to.